In the beginning there was a 19th century neoclassical mansion that even the eye of the most common observer could transform to a unique architectural masterpiece. This mansion has now become the PERANTZADA HOTEL. 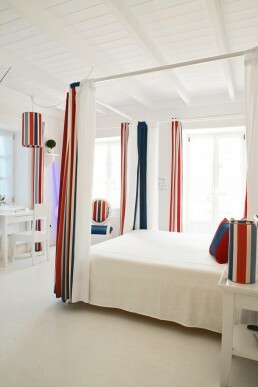 Our decorators have revived it into a great small boutique hotel. All great names of contemporary design, like Varner Panton, Tom Dixon, Ingo Mauer and Philip Stark are hosted here. Feel the Ionian breeze, rest on the Belle Epoque armchairs or walk on the 19th century Persian carpets. Meet up with exquisite artwork by Nikos-Yiorgos Papoutsidis, Steven Antonakou and Antonis Kyriakoulis. Except for this neoclassical mansion, since 2007, 7 rooms have been added to the PERANTZADA HOTEL; one in the neoclassical mansion and 6 in the new mansion, making them in total 17 individually decorated rooms. Ithaca, beloved homeland of the mythical Odysseus-the hero of Homer’s epic poem, the Odyssey-has become a synonym for the love one feels for the land of one’s birth. Perantzada... 1811 is located at the picturesque port of Vathy on the island of Ithaca, off the western coast of Greece. Catering services could not be an exception to the quality that characterizes all the services offered. © 2018 Perantzada Hotel – Ithaca All rights reserved.